Good friends are rare! They are the people who you consider to be like family. With friends you find love, support, and common ground. But as times change, your lives can become filled with more responsibilities, which bring chaos. You do not always get to see your friends, as much as you would like to. In order to maintain your bond and let your friends know, that no matter what happens in your lives you will always be there for each other, it is important to send them messages. 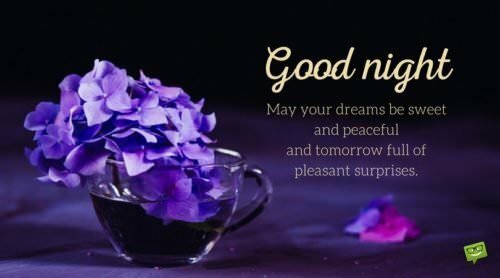 At the end of the day, after all of the responsibilities and ensuing chaos, you can send your friends Good Night messages. You can provide your friends with the peace that they need. Depending on the personalities of your friends, you can send them messages that are cute, short, or inspirational. The messages located here would be perfect for them. Night, night, to a dear friend! 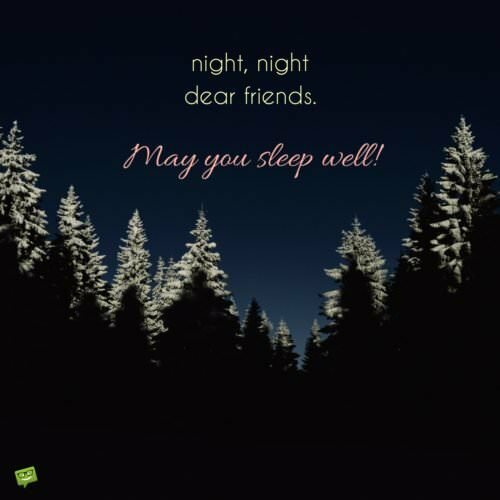 May you sleep well! May the night fill with stars for you. May counting every one, give you contentment! Friend, you make me smile! I hope you are smiling, while you sleep! You are the sweetest person that I know! 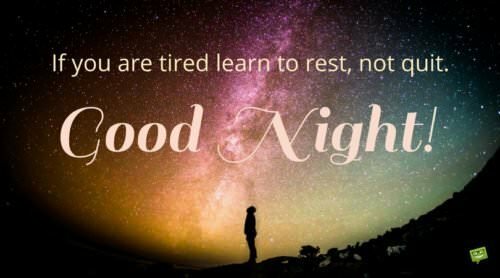 May you feel at ease, tonight, knowing how great you are! 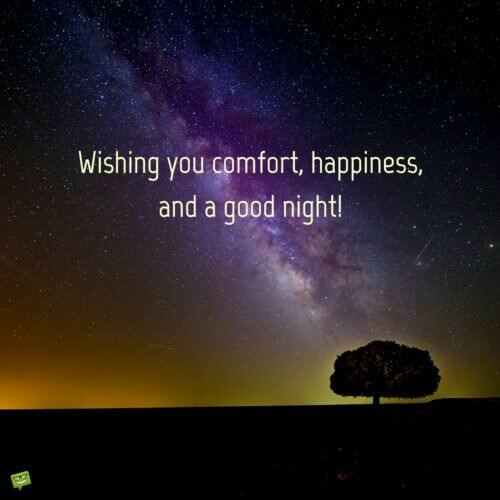 Wishing you comfort, happiness, and a good night! Being your friend is amazing! Tonight, may you enjoy your leisure time! Wishing a friend I hold dear a very, good night! You deserve it! Good night, sleep tight, best friend! Good night, friend! I hope you dream of colorful and fantastic things! I hope tonight finds you snug, friend! Have a Good Night! Good night. The world is better with you in it. 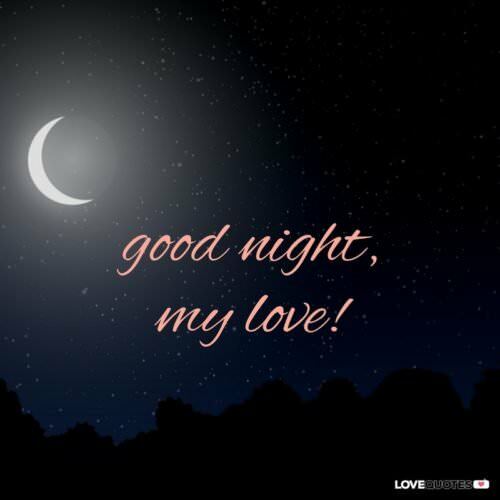 Wishing you a comfy night, friend, that promotes sleep! Good night to a friend who is the best! Get your forty winks! Good night, friend! May the sheep you count tonight, be fluffy and numerous! May your pillow be soft, and your rest be long! Good night, friend! Good Night, my precious friend! May you feel safe and loved! Good Night, to my adorable friend! You hold a special place in my heart! I hold your friendship close! I hope you have a Good Night! You are such a good friend! May the night you have contain only good things! Good night to a friend who is nice and makes everything swell! If you’re tired learn to rest, not quit. Good Night. Being friends with such a caring person like you is one of the major reasons I am so grateful to be alive. Good night. True friendship like ours is worth more than all the wealth in this world. May we never be apart. Good night. One of the greatest blessings a person can get is to have a true friend. You, my friend are a true friend. Good night. Ours is a friendship that is destined to last forever. Not even the distance between us can change it. Good night, and sleep tight. May guardian angels be with you all the time and may sadness not know its way to your doorstep. May happiness and goodness surround you all the time. And most importantly, may God always bless you. Good Night. Your true friendship just goes to proof the fact that the best things in life are free. You illuminate my life with your friendship and make life more enjoyable. Have a good night. Sweet dreams! As you go to bed tonight, know that I will always be that friend you can rely on in times of trouble. Good night. I wish to end this day by letting you know that you always have a true friend in me. Good night and have sweet dreams. I just wanted to let you know that I can never exchange our friendship for anything. Good night and have a nice sleep. Dear friend, do you know you are a priceless gem in my life? Well, now you know. Good night and have pleasant dreams. Dear friend, keep calm and forget all about your worries and troubles. There is always hope. Good night. As you turn off the light, keep in mind that out of sight isn’t out of mind to me. Regardless of the distance between us, you are always in my thoughts and prayers. Have a good night, dear friend. After an exhausting day, it is only fair that we have a sweet sleep. Have a magical night and sweet dreams. Good night. 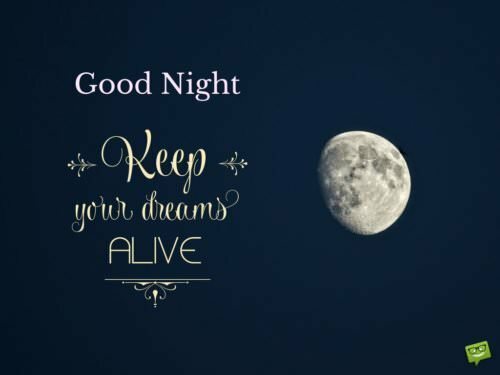 May the stars and the moon comfort you as you sleep. Good night buddy and have sweet dreams. Good night, to my very best friend! 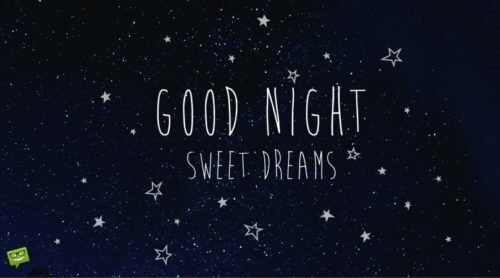 Have the best night’s sleep, friend! Sleep well! May there be no troubles, tonight! May the rest you have come easily! 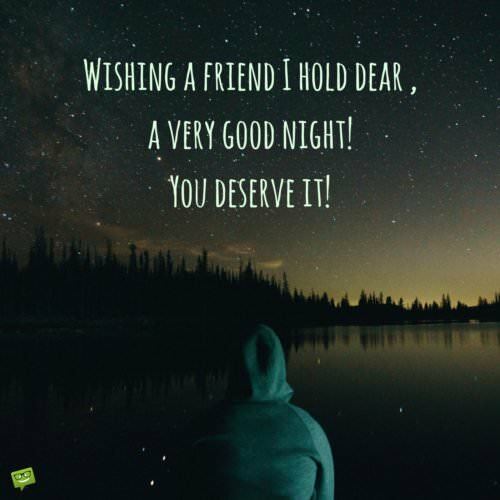 Have a very, good night, friend! You are wonderful! Relaxation is in order for you! Good night, friend! Now relax. The day is over. You did your best. And tomorrow you’ll do better. Good Night! Good night. May you have sweet dreams tonight. Sleep peacefully tonight, my friend, for the angels are keeping watch over you. Sleep well, dear friend and have sweet dreams. Regardless of how your day ended today, know that tomorrow will be better. Good night, my friend. Throw your worries away and sleep peacefully tonight, dear friend, for tomorrow will be sunny and brighter. I pray your sleep is accompanied by sweet dreams. Good night. Don’t give up, my friend. You don’t know what tomorrow will bring with it. Have a blissful sleep. As we wait for a brand new day, good night and have beautiful dreams. Thank you for always being a true friend to me. Good night. Dear friend, I wish you a night of peace and bliss. Good night. Darkness cannot last forever. Keep the hope alive. Good night. By hook or crook you shall have sweet dreams tonight. Have a good night, buddy! Good night, my friend. I pray that the good Lord watches over you as you sleep. Sweet dreams. Good night, friend! May you be filled with tranquility! 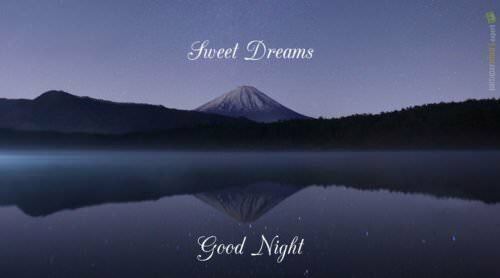 Wishing you a calm night, friend! I hope it is good! Good night, friend! Now is the time for a breather! 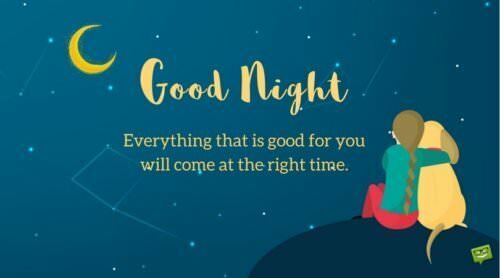 Wishing you a night where you can recharge for tomorrow! Slumber tonight, good friend, and feel well rested, tomorrow! May you have solace tonight, friend! May there be peace and quiet! Wishing my good friend relief from a hard day’s work! Good Night! Good night, friend! May you have silence for sleep! Friend, may you be in a state of stillness that lasts all night! Have a night that is noiseless and comfortable, friend! Tonight, friend, take a breath! Put your feet up and relax! Good night, friend! May all the pressure of the day be alleviated! Let there be no troubles, dear friend! Have a Good Night! May there be no chaos, tonight, friend! May there only be peace! Good Night. Everything that is good for you will come at the right time. 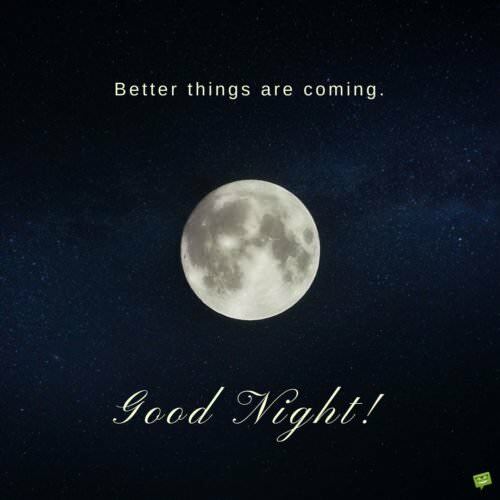 I hope you have a good night! 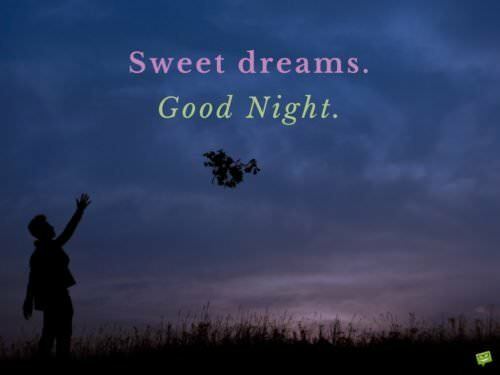 May you sleep peacefully, friend, and only have good dreams! May you wake up refreshed and ready to take on anything! 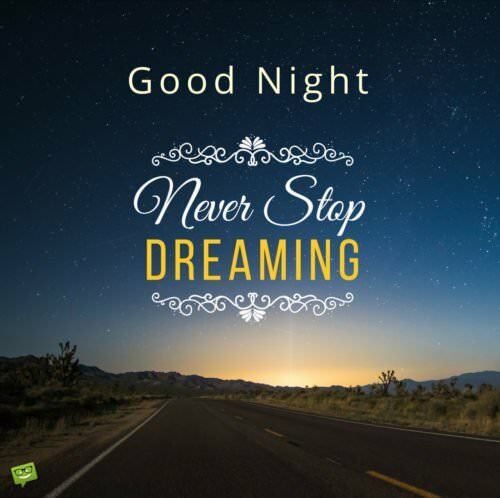 May the dreams you have tonight, come true tomorrow! You can do anything that is on your mind and in your heart! Your presence rouses me to action, friend! You always know how to make things happen! 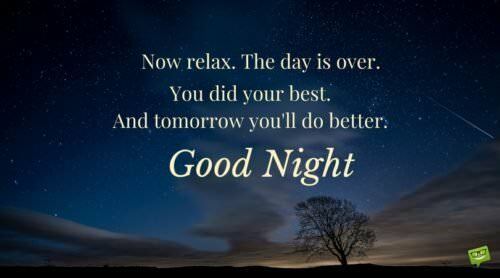 I hope that, tonight, you relax and accomplish new goals, tomorrow! Let your imagination go tonight, friend! With sleep, you have a chance to have dreams with endless possibilities! Sleep peacefully, friend and awaken with a view of the future that is grand! You have the courage and tenacity to complete everything that you set out to do! May your experiences while you sleep tonight, friend, be pleasant! May it inspire you to have good experiences, the following day! Being associated with you frees me from my troubles! Dearest friend, I am wishing you a night that is devoid of disturbances! May you only know quiet and serenity! Every day, you encourage me to do new things, friend! May tonight’s rest bring a new day that overflows with courage and exciting events! 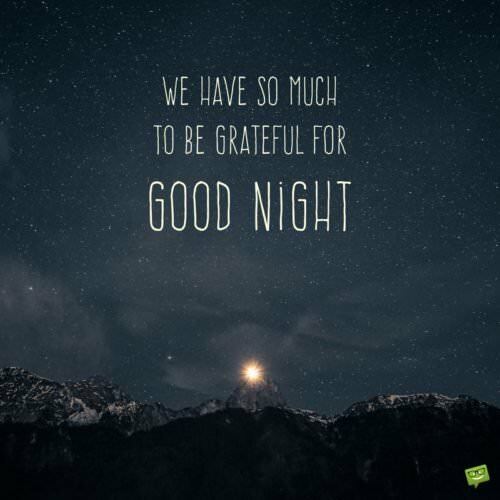 Wishing you comfort, happiness and a good night! 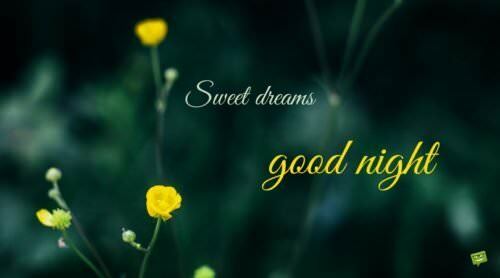 When everything is brought to a standstill, friend, I hope that your thoughts are good, as you drift to sleep! May those thoughts remain with you, during all of your days! When the day is done, friend, may you know that you have done well! When you sleep tonight, friend, may you view all the you hope for, tomorrow! May there be no activity for you tonight, friend! May the rest that you have coming to you arrive swiftly! May the activity that you do tomorrow match your pace and be all of your own making! In our friendship, I view you with the utmost respect! I know that you days can be so hectic, that it is difficult to feel settled, at night. I wish that tonight, you can feel settled and that nothing will occur to bother you! I wish that this will serve as a model for all of your upcoming nights, and that you will be granted the peace that you have given me! Night night, dear friends. May you sleep well. Friend, may the quietude you experience tonight move you to have many more nights like it! May you find your peace and hold on to it! Friend, I want to remind you that your strong mind has brought you peace, before. May it do that again, tonight! May you hold acknowledgment of this with you! Friend, you do not hesitate to get things done! Take tonight to relax and do more, tomorrow! Sleep tonight, friend and be well! Know that you have done your very best today, and that you will do your very best, tomorrow! Do you know what is so great about sleeping? You get to forget all about the troubles in life for a while. Good night. Friends like you help me forget all about my worries. Friends like you inspire me to keep keeping on. Thank you for giving me hope. Good night. Sleep your worries away tonight, for tomorrow will be better. Have a good night. You’re a shining star. Don’t ever give anyone the opportunity to dull your shine! Good night! Tomorrow is a new day and a brand new opportunity to turn things around. Good night and sleep tight. As you lay your head tonight to sleep, know that the good Lord has the solution to all your problems. Good night. 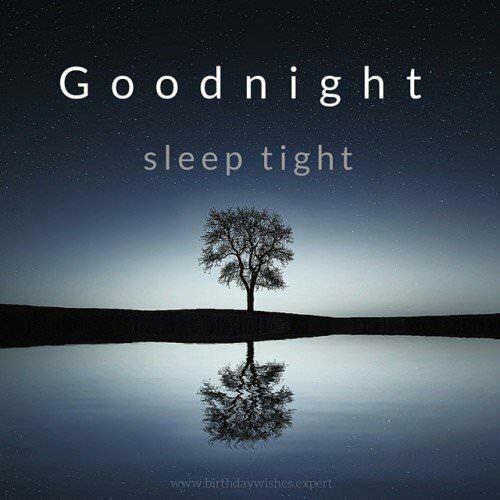 Sleep in peace tonight with the knowledge that God is awake and watching over you. Sweet dreams, my friend. Sweet friend, as you retire to bed, know that I believe in you. Please don’t ever give up in life. Good night and have pleasant dreams. Good Night. May your dreams be sweet and peaceful and tomorrow full of pleasant surprises. This night, friend, is for promoting wellness! Do not focus on the events of the day! Let go and be at peace! Have a Good Night! Friend, you set an example all aspire to! You make me feel proud to know you! Rest tonight, knowing that you have made a difference to me and every one else is fortunate enough to cross your path! Good Night, friend! May the thoughts you possess be so calming, that you easily fall asleep! May that kind of tranquility stay with you! Wishing a friend I hold dear, a very good night! You deserve it! Studies have shown that having a good night’s sleep has the ability to drastically wipe away our worries and fears. 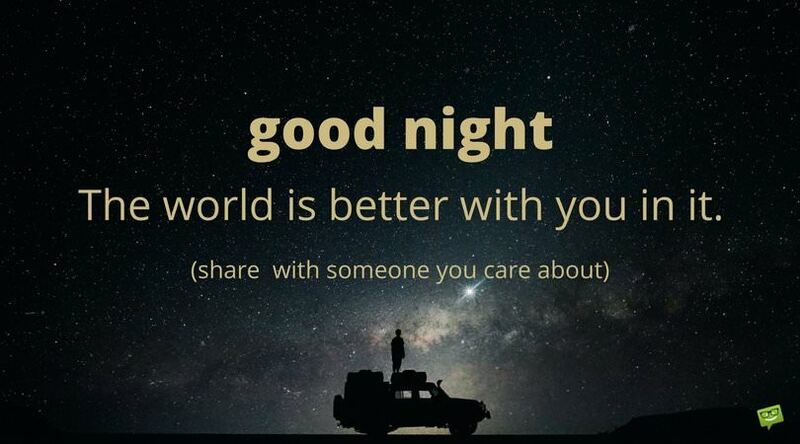 So sleep tight and have pleasant dreams. Don’t ever let your fears keep you awake all night. Just switch off your light and drift into sound sleep with the knowledge that I will always be there for you. Wishing you a peaceful sleep and pleasant dreams tonight. Good night, my friend. The day has come to an end but it’s not going to be long before a brand new day comes. I therefore entreat you to never give up because life always presents us with several more chances. Good night. We have so much to be grateful for. Good night. Whatever I did in my past life must have been so great for destiny to lead me to such a wonderful friend like you in this life. Thank you for being my best friend. Wishing you a blissful evening and a peaceful night. Good night. I can’t wait to be in your company again in the morning. Your friendship means the world to me. I don’t know how you do it, but you always put a smile on my face. There’s nothing I wouldn’t do to put a smile on your face. I just hope I can make you as happy and proud as you make me. Sweet dreams. You have always been by my side to support me. Dear friend, thanks for always being my pillar of support. 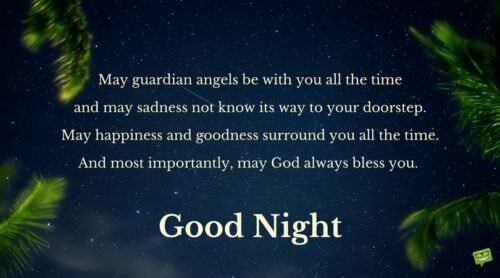 May angels watch over you as you lie down to sleep. Good night. Life is hard but with a wonderful friend like you by my side always offering me a shoulder to cry on, my troubles in life become manageable. I wonder what my life would have been like without your presence in it. Thank you for your priceless friendship. And as you go to bed tonight, know that you are always in my prayers. Have a good night. Better things are coming. Good night. Good night. Never stop dreaming. Good night. 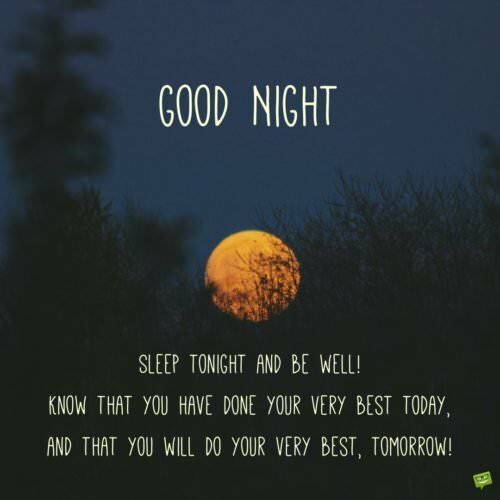 Sleep tonight and be well! Know that you have done your very best today, and that you will do your very best, tomorrow! 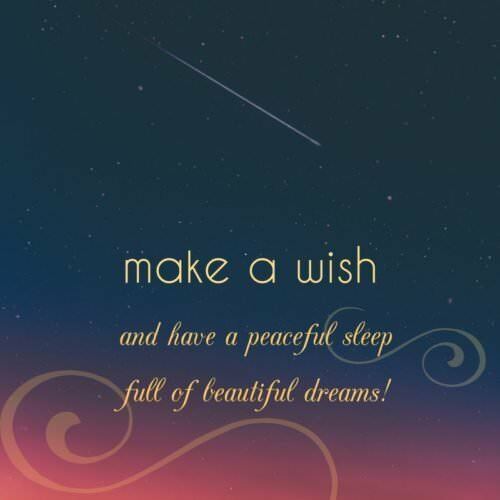 Make a wish and have a peaceful sleep full of beautiful dreams!